The continuous communication of the staff training center with the health professionals will make it possible to identify the weaknesses of current training and better ways to be trained. This process can help to continuously improve the quality of education and retraining. Because health care providers provide basic health services to people, each organization needs an evaluation system to be aware of desirability and quality of their activities especially in complex and dynamic environments; on the other hand, the lack of an evaluation and control system causes the death of the organization. In all countries, regardless of their wealth or extension, peoples' health is providers to do their best, regarding the available resources. Attention to health in all levels of the country is of goals of Islamic Republic of Iran plans. One of the effective and inherent factors of management is performance evaluation which ensures weak and strong points, threats, and opportunities to improve the approaches high education centers, as a part of administering system can educate expert and trained human force as a model, if applying proper methods. Medical science has many parts which connect each other like a chain and is correlative to convert the student to a capable graduate. Learning fields divided into three main parts: attitude, knowledge, and skill. The goal is to provide chances to speed up and facilitate learning in an educational system. Training can make learning in the learner. Learning is a process to achieve knowledge and skill and also the ability of people in decision-making and performance, which will finally lead to change in behavior. In a categorization, education method is divided into two attendance training and distance training. Attendance training is those in which attendance of the student and instructor is needed to get her. Moreover, the learner and trainer connect directly and there is no intermediate between them like class, lecture, and workshop., Distance training is a training method in which the teacher–learner is far from each other, so the training is not direct in which there is an intermediate between them which is also known as distance learning and media learning.,, In a distance learning system, learning means self-learning and self-education and creating opportunities to train people who cannot reach attendance training for lack of training centers, enough time, and time and location limits. Therefore, it will provide them a flexible learning chance. A study on knowledge and performance of women in Sistanand Baloochestan province showed that health-care center networks, especially community health workers, play an important role to improve knowledge about malaria and to prevent it. In the research, Zolfaghari was referred to contraceptive methods, and they concluded that there was a meaningful difference between midwives and community health workers' performance, and in fact, there was a contract meaningful relation between education level and performance. People's participation plays an important role in promoting society.,,,,, One of the fundamental solutions is to improve health-care training level which acts with different methods to modify knowledge, believe information, and reach to healthy lifestyle and behavior. Training of primary health care is a very important canal and should specify the relation between beliefs and attitude of people with their behaviors to increase health. Training provision in different health-care fields of their important duties;, therefore, level of community health workers' knowledge affects the social health as the first labels to provide health-care services. Hence, continuous measure of information and community health workers' attitudes is needed if training and relearning workshops are needed to improve knowledge level and attitude of them which play more important role to provide services. The other members of health team are midwives. Midwives can participate in health improvement activities actively and play an important role to accept health-care commands. The purpose of the study was to compare the scientific knowledge and performance of the members of the health team by community health workers. The research method was noninferential. Although other methods could be used, we would prefer to use this method because of the geographical dispersion and the path to the target group. This difference is more meaningful when it comes to educating the health-care professionals. The test score of the community health workers was compared with other members of the health team. Community health workers' education in the course of 2 years is based on a description of duties and skills and training along with coaches. This training method deepens their learning. These items can be one of the benchmarks. Therefore, it is hoped that in this study by description of current conditions in rural and urban health-care centers of Kashan and Aran and Bidgol, good advance and steps would be observed to improve health behaviors of these people and total society. The research was analytical-descriptive. The knowledge of all members of the health team of Kashan University of Medical Sciences about phc was studied. The present study population was all community health worker experts' labels of family health and midwifery employed in urban and rural health-care centers of Kashan University of Medical Sciences was 229 people whom invited all the test, but 119 of them participated in the test. No participant selection was carried out, and all the population was included in the study to study the knowledge level of participants. First, the training booklet which was prepared and set by community health workers' training center trainers and then were sent to health-care centers and health houses of Kashan University of Medical Sciences, and after 2 months, the participants were invited to meet in community health workers' training center and attended in the test. To attend the participants in the center transportation service provided by the center, data were collected by the questionnaire which was divided in two parts: the first part included 90 test choice questions about knowledge evaluation of knowledge including 5 questions about aging, depression, and health; 4 questions about care and screening from 6 to 70 years; 5 questions about benefits of natural delivery; 4 questions about food miracles; 4 questions about medication estimation in health houses; 5 questions about high blood pressure (hypertension); traditional medical, and heart diseases; 5 questions about lung cancer; 5 questions about asthma in kids and natural anti-coughs; 5 questions about bandage and dressing; 5 questions about child abuse; 5 questions about diabetes; 4 questions about thalassemia; 4 questions about research in health houses; 4 questions about quality improvement; 4 questions about empowerment of the society to promote the health; five questions about acquaintance with diagrams for analysis; 5 questions about safe injection; 5 questions about physical activity pyramid; 4 questions about tooth care; and 4 questions about addict rehabilitations. To determine scientific validity of the collection, content validity methods were applied using reference books and specialized and expert professors of Tehran University of Medical Sciences and Azad university, Islamic Azad University, Science and Research Branch, Tehran, and also trainer and expert of community health workers' training center of Kashan University of Medical Sciences. Reliability of this questionnaire was confirmed by Cronbach's alpha test and internal consistency method and the questionnaire's Cronbach's Alpha was 8, and stability coefficient was measured by separation of target groups which was obtained 0.87, 0.83, and 0.84 for community health workers, disease expert with B. S or associated degree, family health expert with associated degree, and midwife, respectively. Difficulty coefficient and question differentiation coefficient were also measured by software to be removed if required. The questionnaires were without name and filled out by the participants and in the presence of the questioner and consultancies was not possible for the participants and they were told that all the information would be kept secretly. Stability of the questionnaire was also confirmed in the same method for knowledge measurement questionnaire by internal stability test and pilot test, and a chromate coefficient was obtained 0.87. Participants' list was prepared regarding the available date in community health workers' training center and with the agreement of training council and getting the permit from training execution committee of Kashan Medical Science University: Qamsar, Kamoo JosheghanGhali, Barzok, Niasar, Meshkat, Imam Ali, Amir Kabir, Hassan Abad, SoltanAmir Ahmad, 22nd Bahmansubbed area, FatemiehZeidi, Fin Bozorgkargar, Golabchi, MoslemebneAghil, NavabeSafavi, and Lathor from Kashan and Abouzeidabad, Nooshabad, Sefi dShahr, Shahid beheshti, ValiAsr and Shohada, from Aran and Bidgool. Rural centers included Azeran, Varkan, Ozvar, Maragh, Kalle, Josheghan, Esterk, Sensen, Ghohrood and two mobile teams of Fin and Amirkabirfrom Kashan and JavadAemeh centers from Aran And Bidgol. Educational pamphlets were sent to all health centers of Kashan University of Medical Sciences. Before starting the research, the centers were called and the employed participant under the study was informed about the research. Then, the training booklet was sent for them. In the meeting of the study goal test, they were explained to attend the study in a full knowledge level. Along with sending the booklets, the participants were informed to study the booklets for 2 months and then the questionnaire derived from the booklet from about the test community health workers' experts of midwifery family health and diseases with BS or associate degree employed in all health-care centers and health houses of Kashan Medical Science University who were willing to attend the study participated in evaluation test of final knowledge level test and those who did not intend to tack part in the study or cancelled it could stop attending or leave it. The obtained data from the questionaries' were input to SPSS software (SPSS Inc., Illinois, USA) (Leland Stanford Junior University), and the average scores were measured and by doing paired t-test average scores between experts of discusses with BS or associated degree, and community health workers were compared and then average score of knowledge level in experts of family health and midwifery with BS or associated degree were compared with those of community health workers regarding the extension of the project and doing distance with community health workers training center and also necessity of sending training booklets to the other health team members and their attendance we faced to problems to coordinate between the participant because of high work load of them; therefore, data collection in the training booklet challenged the feasibility of the plan regarding the limitation in scientific references for community health workers sand accordance with the scientific and skill level of other health team members. From 229 invited participants, 185 participated in the test including 145 men and 40 women and all were married. The participants included 69 community health workers, 61 family health experts, 39 midwives, and 16 disease experts. 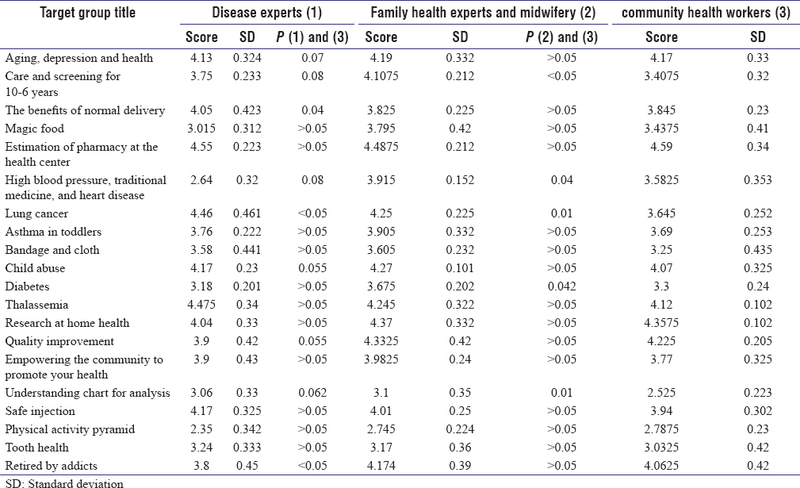 The highest score percentage obtained in target group of disease experts was 91%, in target group of family health experts, and midwifery was 89.7%, and in group of community health workers was 91.8%, which were related to issue of drug estimation in health houses [Table 1]. The lowest percentage score obtained in target group of disease experts was 47% and in target group of family health and midwifery was 54.9% related to the issue of physical activities pyramid, and in community health workers, it obtained 50.5% which related to the issue of acquaintance with diagrams for analysis. The average obtained score is 72.46% for target group of disease experts with 16 participants (1146.68 of 1600 score), 77.11% for family health experts and midwifery with 101 participants (7688.88 of 70,700 score), and 70.68% for community health workers with 68 participants (4751.12 of 6700 score). In general, the average score in target groups except community health workers was 74.8% with 177 participants and standard deviation of 3.3. This was obtained in community health workers 70.64% with standard deviation of 2.9. The obtained scores in the test for different target groups are given in [Table 2]. According to the results, there was no significant difference between the awareness of community health workers with other members of the health team. The Ebadi's research also confirmed the results of our research. In the study of Shiva et al., knowledge level of personnel involved with kid health was undesirable in way of safe injection which was not in accordance with this study. Azar barin concluded in his study in several hospitals of Isfahan that the highest level of standard dressing cases was middle which is not in accordance with the present study; however, knowledge of target groups of the current study measured desirable in bandage and dressing. Dabiri noted that the program and the proper ways to empower and educate girls to learn life skills is required, the results of the present study confirms. Azemati remarks his study that training courses about nourishment and food matters are necessary which is along with the current study. Farshad Far estimated satisfied part of community health workers' activities about diabetes and hypertension and added that by increasing the number and improving the quality of training courses on noncontagious diseases for community health workers can have a positive influence on primary health system of the country which is in accordance with the current study results. Due to the shortage of human resources, distance education training, especially electronic education, is recommended to increase the distance learning method for personnel. Finally, it can be claimed that this kind of media is effective even in some clinical skills. As in the training text medication estimation in health house, the highest obtained score is for community health workers target group. Looking at [Table 2] showed that applicable issues in each target group obtained the highest score percentage for instance, safe injection which was more applicable in disease fight group obtained the highest score in the group, and acquaintance with diagrams for analysis had the lowest score in all three target groups. Due to less function of the forces with this issue, there had been no training class about it. The obtained score of community health workers on courses aging, depression, and health benefits of natural delivery, tooth health addict rehabilitation, and physical activities had no significant difference with those of midwifery or family health target group in terms of scientific data, while in issues such as benefits of natural delivery, it seems that diseases fight target group had more information that other groups; however, the results show that they have less information in courses such as diabetes and hypertension than other target groups even community health workers. On the other hand, in course of benefits of natural delivery, it is observed that the obtained score is less than other groups in midwifery and family health target groups; due to the lower cost of distance training in this method, personnel training needs can be met as well. Knowledge and information of health-care personnel had no relation with educational degree, but it can be related to the forces performance to apply the issues in their occupational position measurement of training needs of the personnel is necessary. In general, community health workers awareness of most courses was equal to or greater than midwifery or family health and the fight against disease experts. Their knowledge was in fact more than the other groups in courses such as acquaintance with diagrams for analysis community health workers showed less information because of lack of training in relearning classes or as it was out of their duty and had no apply for them. At the end, it is recommended to give more training to community health workers and to be more recruited and received better facilities. Finally, the authors thank from support of clinical research unit of Kashan Shahid Beheshti Hospital. Chegini YR, Rahbar MR. Psychology of Learning and Teaching; 2002. World Health Organization. Health Systems Profile of Islamic Republic of Iran. World Health Organization; November, 2005. World Health Organization. Eastern Mediterranean Regional Office (EMRO) Division of Health System and Services Development (DHS) Health Policy and Planning Unit. World Health Organization; Biennial report, 2008-2009. Siroos P. Management Services in Cities Health Networks. Tehran: Ministry of Health and Medicine Education; 1999. p. 113. Esmat JB. Expantion of Health Networkes in Iran. Tehran: Ministry of Health and Medicine Education; 1369. Peng B, Paterson PE, Tai BJ, Fan MW. Changes in oral health knowledge an behavior 1987-95 among inhabitation of Wuhan city, PR China. Int Dent J 1997;47:142-7. Nielson B. Breast cancer screening Seminar. Oncol Nurs 1991;7:161-5. Balali Meibodi F, Mahmoudi Zarandi M, Hasani M. Knowledge, attitude and practice of health workers working in the Southern cities of Kerman province about oral and dental in 2009. J Rafsanjan Univ Med Sci 2011;10:69-74. Ansari S, Soleimani B, Sadri GH, Bahonar A. The effect of education on knowledge, attitude and practice of health workers working in the education centres about accut spiral enfections. J Educ Med Knowl 1384;5:37-42. Arbabi HR. Health Education and Communication. Tehran: Boshra Publication; 2007. Gharib M, Arefiyan H, Khalkjali HR. Compare to traditional education and cooperation on the level of learning. Tehran Univ Med Sci J 2004;12:1016-7. Farahani A, Keshavarz L. Media's role in the course of table tennis physical education degree distance education system. Olympic J 2003;1:69-75. Baraz S, Mohammadi E, Boromand B. Comparison of two methods of face to face and distance education self-care on quality of life and physical problems in patients treated with maintenance hemodialysis. Rahavard e Danesh J 2006;9:71-4. Saberiyan M, Hajiaghajani S. Planning Process in the Medical Curriculum. Tehran: Salemi Publication; 2006. Rezay M. Independence Education in Educational System. Tehran: Payam Noor University Research Center; 1380. p. 52-64. Mirsadraei M. Assessment of attitude and practice of the health workers in selected area, South of Tehran and Guam. Hayat 2000;6:54-60. Bariri T. The effect of education on knowledge, attitude and practice of health workers working in the education centres about breaste chekups. Mashhad J 1381;4:39-45. Mosleh A, Rezaei M. Evaluation of drug prescription to under-5-year-old children by junior paramedics in Rey city (2002). Behbood J 1386;11:157-68. Nojomi M, Tehrani A, Moradi M. Comparison of knowledge of interns and health care workers about control of diarrheal disease. Hakim J 1385;4:12-6. Pileroodi S. City Hygence Network. 1st ed. Razavie Publisher: Ministry of Health and Medicine Education; 1376. p. 49. Quillian JP. Community health workers and primary health care in Honduras. J Am Acad Nurse Pract 1993;5:219-25. Davies-Adetugbo AA, Adebawa HA. The Ife South breastfeeding project: Training community health extension workers to promote and manage breastfeeding in rural communities. Bull World Health Organ 1997;75:323-32. Wu Z, Detels R, Ji G, Xu C, Rou K, Ding H, et al. Diffusion of HIV/AIDS knowledge, positive attitudes, and behaviors through training of health professionals in China. AIDS Educ Prev 2002;14:379-90. Ignata V, Donna B. Medical Surgical Nursing. Philadelphia: W.B. Sanuders Co.; 1999. p. 7. Turani H, Milajardi M. Relationship between the principles of human relations and productivity of managers of high school girls in Tehran, Educational Innovation 2009;8:75-100. [In Persian]. Nastiezaie N, Hezare Mogadam M. A comparative survey on effects of face to face and distanced short term training courses on staff's psychological empowerment. J Urmia Nurs Midwifery Fac 2011;8:254-65. Lane DS, Messina CR, Grimson R. An educational approach to improving physician breast cancer screening practices and counseling skills. Patient Educ Couns 2001;43:287-99. Taghavizade Ganji A, Jafari A, Poorgholi N, Iranizadeh H. Evaluation of knowledge, attitude and practice of Tabriz, school health workers about oral and dental health. J Dent Tehran Univ Med Sci 2009;22:132-8. Khademi H, Kaviani N, Iraqi Zade AM, Jafari MR. Knowledge and attitude of Isfahan workers in preventing oral diseases. Hormozgan Med J 2007;11:91-5. Ebadi A, Yousefi Goshtasb S, Khaghanizadeh M, Hosseini SM, Raeisifar A, Masoumi M, et al. Comparison the effect of conventional and distance training on nurses' clinical skills. J Mil Med 2010;12:71-4. Shiva F, Shiva FR. Injection practices in children: Knowledge and perception of healthcare workers. Pejouhesh 2008;32:247-52. Azarbarzin M. Association of the background experience of nurses and their consideration for the standards of muscular injections and dressing in some selective hospitals in Esfahan. Med Sci 2008;18:55-60. Dabiri F, Abedini S, Shahi A, Kamjoo A. The effect of different methods of health education on knowledge, attitudes and practice of female students regarding menstrual hygiene in Bandar Abbas (2006). Hormozgan Med J 2009;12:271-9. Azemati B, Heshmat R, Sanaei M, Salehi F, Sadeghi F, Ghaderpanahi M, et al. Nutritional knowledge, attitude and practice of Iranian households and primary health care staff: NUTRIKAP survey. J Diabetes Metab Disord 2013;12:12. Farzadfar F, Murray CJ, Gakidou E, Bossert T, Namdaritabar H, Alikhani S, et al. Effectiveness of diabetes and hypertension management by rural primary health-care workers (Behvarz workers) in Iran: A nationally representative observational study. Lancet 2012;379:47-54.